This is the most realistic, durable roping dummy on the market today. 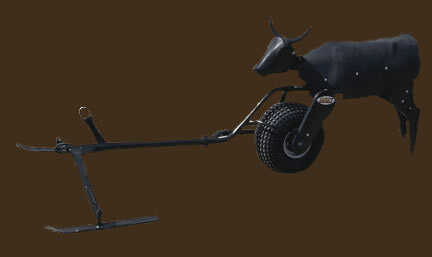 The newly designed legs have a ground driven motion most like a real steer. The additional hip joint creates a motion that actually leaves a clear hoof print in the dirt like a real steer does. New sculpted legs that are 2 pieces with knurled surface for realistic feel in your delivery. This wider stance is designed to dally on as hard as you want for years. Same Great “Jen-Stick” as in the regular CrossFire, that kicks your rope out when you are out of time. The head has realistic movement and release horns. Comes with a two speed pully. Pull it at regular speed or change the belt and tow it slow while the legs and hips move faster. With the NEW SPRINGER Hitch. The flexible legs have a ground driven stride that actually comes in contact with the ground. The “Jen Stick” moves back and forth in time with the legs and kicks your rope out when you are out of time. The hips move up and down in time with the legs. This hip action gives you the visual tool you need to practice your timing correctly. The head has realistic movement and release horns. You can dally on these legs! Just like the CrossFire Model without the “Jen Stick”. Same Hip Action, Head and Legs.